Posted on 09/24/2018 by Mark Engleson	in Live Review and tagged Americana, country, folk, Gypsy Sally's, Larry Campbell, New York City, roots, Teresa Williams. 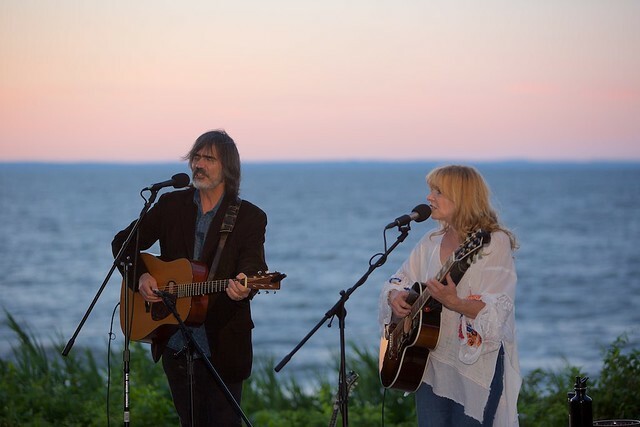 Americana/roots music duo Larry Campbell and Teresa Williams have impressive resumes. For eight years, Larry, a multi-instrumentalist and singer-songwriter, played guitar in Bob Dylan’s band. After working with Dylan, Larry became the bandleader for Levon Helm, formerly of The Band, and Teresa, a singer-guitarist, joined him. They’ve worked with any number of prominent artists: Jorma Kaukonen, Little Feat, and Phil Lesh. Larry and Teresa showcased the skills that won them those collaborations to Gypsy Sally’s recently. I first saw Larry and Teresa open for Shawn Colvin, who they played in a band with many years ago, at The Birchmere last November, and they impressed me. Larry and Teresa are incredibly gifted artists and exceptional performers. When I saw they were coming back to the area, I knew this was a can’t-miss show. They surpassed my expectations, delivering a show full of beautiful music, variety, and charm. During the show on Sept. 20, Larry played both acoustic and electric guitar, as well as banjo and fiddle. The couple covered music that can truly only be described as Americana, ranging from blues to country to folk to roots rock and even a jazz tune, Duke Ellington’s “Caravan.” Larry and Teresa got soulful on “Poor Old Dirt Farmer,” a folk song on the Grammy-winning Levon Helm album that Larry co-produced, and they rocked out on “It Ain’t Gonna Be a Good Night” from their most recent album, 2017’s Contraband Love. Larry and Teresa’s experience also revealed itself in their stage banter and storytelling. They strung a thread and came back to it, drawing the audience in and entertaining them. The premise was simple: It was the story of Larry being a New Yorker and Teresa being from West Tennessee. But, more specifically, as Larry said with a smirk, Teresa is from Peckerwood Point, which is right next to Lizard Lick, “40 miles from Jackson.” Later, Teresa said that normally New Yorkers aren’t welcome where she’s from, but Larry being a musician, and specifically a string player, bridged the cultural gap. It was funny, and heartwarming, to hear her to talk about her dad calling up Larry on the phone for guitar lessons and advice; again and again, we are reminded of how music breaks down barriers and brings people together. When it comes to Americana, this show was the real deal. The crowd at Gypsy Sally’s, which is never too over-the-top, was applauding, not just on the songs, but on the vocal and instrumental solos. On Thursday night, people knew they were seeing something special.